The Intense Series 4000 diode lasers are single mode index guided quantum well structures. The lasers provide high power, low astigmatism, and narrow spectral width with a single spatial mode Gaussian far field. 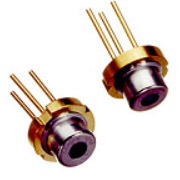 Standard packages for these lasers include 5.6 mm and 9 mm with monitor photodiode.